Fermented foods are way less common in our society today than they were even a hundred years ago. People like Laura Ingalls most likely grew up eating a bit of fermented foods at each meal, often served like a sort of condiment (not a main dish). It was necessary to preserve foods in those days because refrigerators did not exist, and food crops are obviously seasonal (especially in places like Walnut Grove, where the Ingalls Family lived). 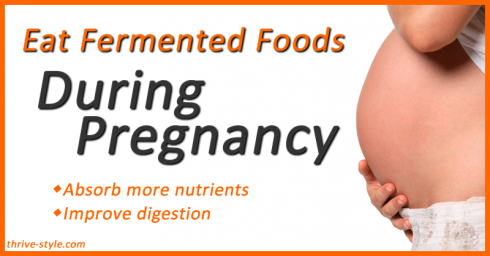 The benefits of fermented foods go way beyond preservation though, and adding them to your diet during pregnancy can be especially helpful. Fermenting foods adds colonies of healthy bacteria to it. It also helps to destroy unhealthy bacteria while keeping beneficial enzymes intact. When a person consumes this fermented food or drink, it not only makes digestion of that food easier (because of the enzyme content—which is destroyed in cooked foods), but it promotes a healthy digestive tract flora (the good bacteria populate there, also helping to keep bad bacteria in check). 1. The increased enzyme content of fermented foods assists the body in digestion of food and nutrient absorption (even other foods that are eaten along with the fermented foods). This is especially important during pregnancy because the pregnant woman is building a human being! Nutrient intake is very important, and boosting the nutrient absorption of foods once they are ingested benefits both mother and baby. 2. Increased progesterone levels during pregnancy can lead to a slowdown of the digestive process, which can lead to issues like constipation. Consuming fermented foods and drinks provides the digestive tract with the healthy bacteria and enzymes that will combat or prevent the pain and symptoms of constipation. The digestive system is regulated more effectively overall with the regular intake of fermented foods and drinks. It’s important, though, to ingest foods and drinks that will give you the benefits you’re looking for. Most commercial yogurts and probiotic foods are highly processed and have additives and sugar that dampen or cancel the positive effects. How to Ferment Foods at Home – Oh Lardy! 10 Use for Fermented Foods – Oh Lardy! Do you eat or drink fermented foods and drinks? If so, what’s your favorite?! I’ll check it out. Thanks for letting me know!